Whether you want to honor a loved one, or simply love the look of Mexican sugar skulls, a Mexican skull tattoo could be for you. November 1st, known in the United States as simply the day after Halloween, is known in Mexico as The Day of the Dead or El Dia de los Muertos. This celebration centers around honoring loved ones who have passed on. Highly colorful and decorative skulls made of sugar are used to decorate alters erected to honor deceased loved ones. The skulls are a significant part of Southern Mexican folk art and culture and are easily recognized around the world for their bright colors and whimsical decoration. Mexican skull tattoos have long been a popular way of using these images. The colorful skulls are particularly popular among women and are frequently worn as a way to honor someone who has passed on. 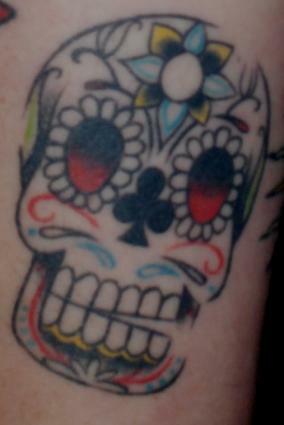 If considering a sugar skull tattoo, begin by determining the reason you are drawn to the idea. If you wish to honor someone, the design process may be very different than if you are getting the tattoo to honor a past life. If you are getting a sugar skull tat to honor someone who has passed, make sure to include attributes of that person in the skull's design. Include their favorite color, music notes if they played an instrument, or their favorite flower if they gardened or any other personal details you wish to recall. Include hats or bows or try to recreate a facial feature of the shape of the face. If you are getting a sugar skull tat for power, strength or simply because you love the look of these decorative candy skulls, make sure to include your own personal details. The skulls are meant to be customized and detailed to reflect both the maker and the one they honor. So no matter what the reason is behind your desire for this design, make sure to include as many aspects of your passion as possible, while still retaining a cohesive design. Make sure when you are creating your skull, and considering its placement that you take into account how the details will be reflected in its size. Small tattoos may lose some of the more personal details, while larger tattoos give you room to spread out and incorporate more. Also consider who you want to see this tattoo. Some tattoos honoring loved ones are placed where only the wearer can see them, while others are meant to be shared with the world. Mexican skull tattoos are colorful, whimsical and not at all what many people imagine when they think of a skull tattoo. Consider one of your own for any number of reasons and wear this detailed image anywhere on the body with pride, joy and a sense of honor.